I was fishing in preparation for a tournament Lake McClure in California. I am always checking my surroundings, as well as the skies above me. 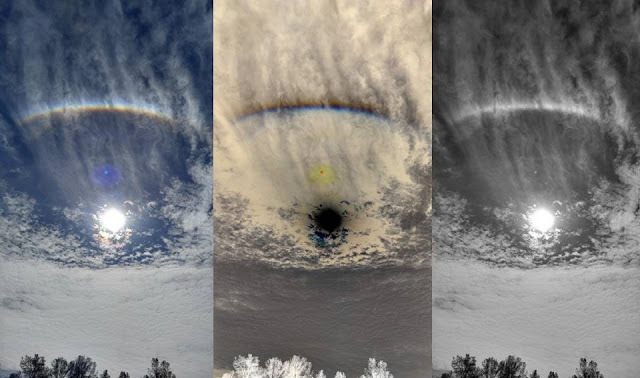 I noticed some unique clouds, and, a partial rainbow around the sun. I took some pictures with my camera, to make sure at least one of them was good. I discovered accidentally, the presence of a blue sphere-like object upon further examination of the prior days photos. At first, I thought it was something on my screen, but it wasn't. Mufon case 82559. Note: The blue sphere-like object is lens flare then the photographer talks about a partial rainbow around the sun which I doubt whether it is a rainbow or a cloaked circular UFO that has become partially visible as a result of reflected sunlight.